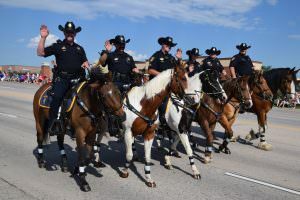 The Douglas County Mounted Patrol continues the tradition of patrols on horseback by Western sheriffs. 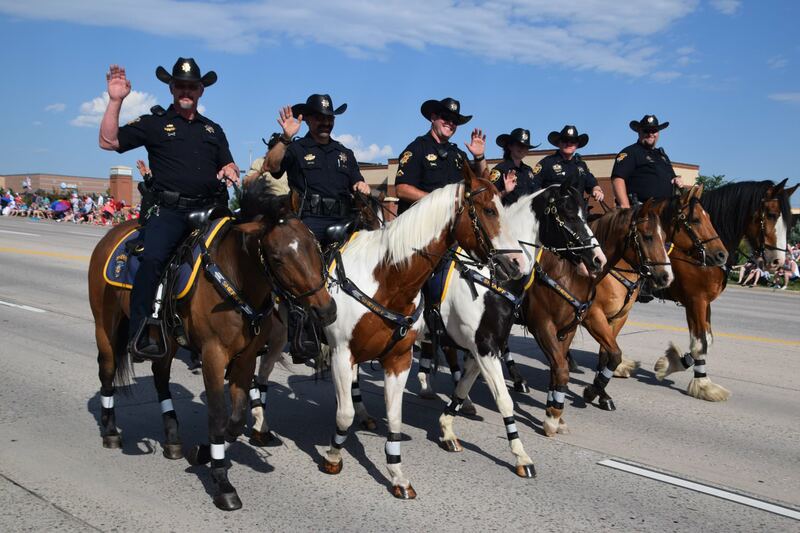 The Mounted Patrol supports special initiatives that call for a mounted deputy, like crowd control, civil unrest and search and rescue. Lost children will approach an officer on horseback before one riding a motorized vehicle. The unit performs public relations at community events, in parades and at ceremonial and honor guard occasions. The patrol also helps neighboring agencies and municipalities upon request. With the officer’s high view-point, and the high visibility, the nickname of “ten foot cop” has gained popularity. A horse and rider provide a force multiplier in crowd control. It is estimated that a well-trained horse and rider have an impact equal to ten deputies on foot. The horses are trained to do a lot of things horses hate to do. They must stand still for hours at a time and move into crowds on command. They need to ignore loud noises, like fireworks and yelling. The horses must also move shoulder to shoulder or nose to tail with other horses and walk, trot, and canter as part of a team. The mounted officer and his horse are required to develop a strong bond to overcome the horse’s natural fear. Horses used in police work must be reliable in temperament. They must be strong enough in personality to approach a crowd or negotiate an obstacle but in the next minute patiently stand and allow a child to pet their nose. The horses selected for mounted police service have been carefully conditioned to perform under pressure and not endanger the general public. The horses are personally owned by their riders who are responsible for the daily care and maintenance including feed, hay, bedding, housing, veterinary and farrier expenses. They are fully certified before being allowed to work in a law enforcement capacity and interact with the public. The unit accepts donations to supplement the maintenance of the horses and equipment utilized to ensure the safety of the horses and riders. Please contact Lt. Rotherham at rrotherh@dcsheriff.net if you would like to make a donation.